All of the referee-recommended articles below are free to access. Biological systems, such as circadian rhythms and ion pumps, are generally able to respond autonomously to chemical stimuli. Such ability is at the root of certain amphiphilic molecules (i.e. molecules containing both hydrophilic and hydrophobic parts) that can change their configurations temporally at the presence of the stimulants. In recent decades, building artificial biological systems with active, adaptive and autonomous behaviours similar to natural biological systems has become a hot topic. Supramolecular assemblies are among the most extensively explored building materials. A supramolecular assembly is a system consisting of complex molecules held together by non-covalent bonds, such as DNA. 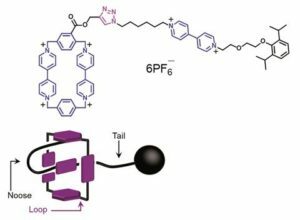 One of the major technological hurdles for developing artificial biological systems using supramolecular assemblies is to acquire assemblies with an amphiphilic nature and the ability to undergo a transient change of configuration when stimulated. The change should also be highly reversible and durable. Currently, extensive research efforts are committed to finding candidates that address the aforementioned challenge. 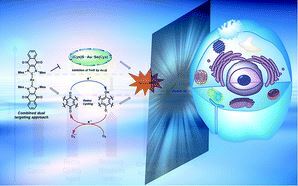 A research group from Jawaharlal Nehru Centre for Advanced Scientific Research in India recently made a step forward and published their work in Chemical Science. 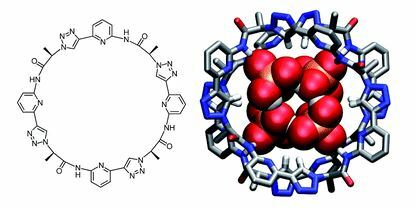 They developed an amphiphilic supramolecular motif, coined PN-VN foldamer, which could switch its conformation upon contact with oxidizing and reducing agents. As shown in Figure 1a, the skeleton of the supramolecular motif is composed of three sections. 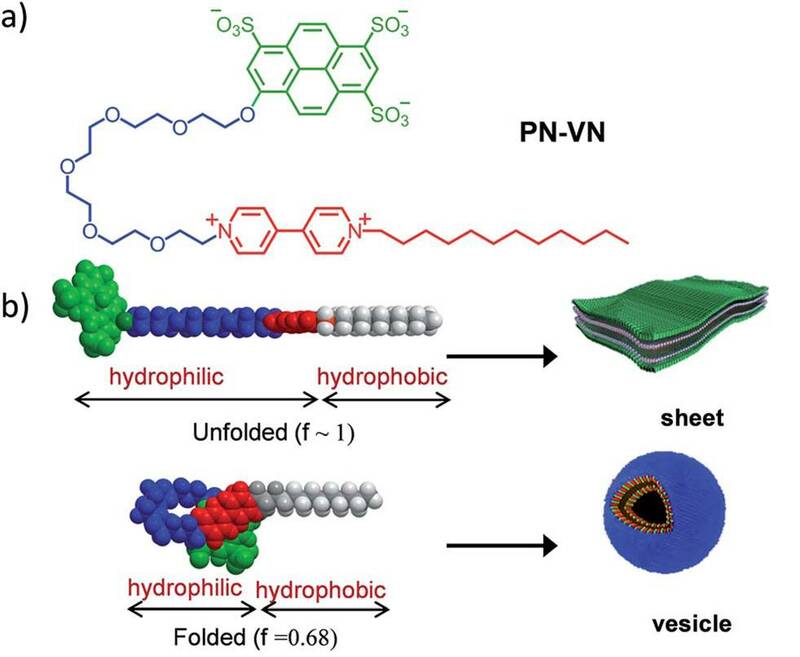 The green head is an electron donor pyranine (PN), the red tail is an electron acceptor called viologen (VN) rendering the hydrophobic nature, and the blue body is a flexible hydrophilic hexaethylene glycol that connects the electron donor and acceptor. Figure 1. (a) The structure of the amphiphilic PN-VN foldamer. (b) Unfolded and folded states of the PN-VN foldamer correspond to sheet and vesicle morphologies, respectively. The researchers demonstrated the assembly pattern of PN-VN foldamers (Figure 1b) by using two chemical fuels, sodium dithionite and glucose, as the stimulants. The transformation process is depicted in Figure 2a. When undisturbed, the negatively charged PN (PN3-) and the positively charged VN (VN2+) can attract each other via a charge transfer interaction, folding the entire molecular chains to vesicles. When placed in a solution containing sodium dithionite and glucose, the VN2+ terminal can be instantaneously reduced by sodium dithionite to its radical cation form (VN•+). The reduction weakens the charge transfer interaction, and subsequently unfolds PN-VN vesicles to sheets. Meanwhile, catalyzed by glucose oxidase (an enzyme), the excess glucose in the same solution can oxidize VN•+ back to its original state, resulting in the folded state that recovers vesicles. The transition is directly confirmed by transmission electron microscopy as shown in Figure 2b. 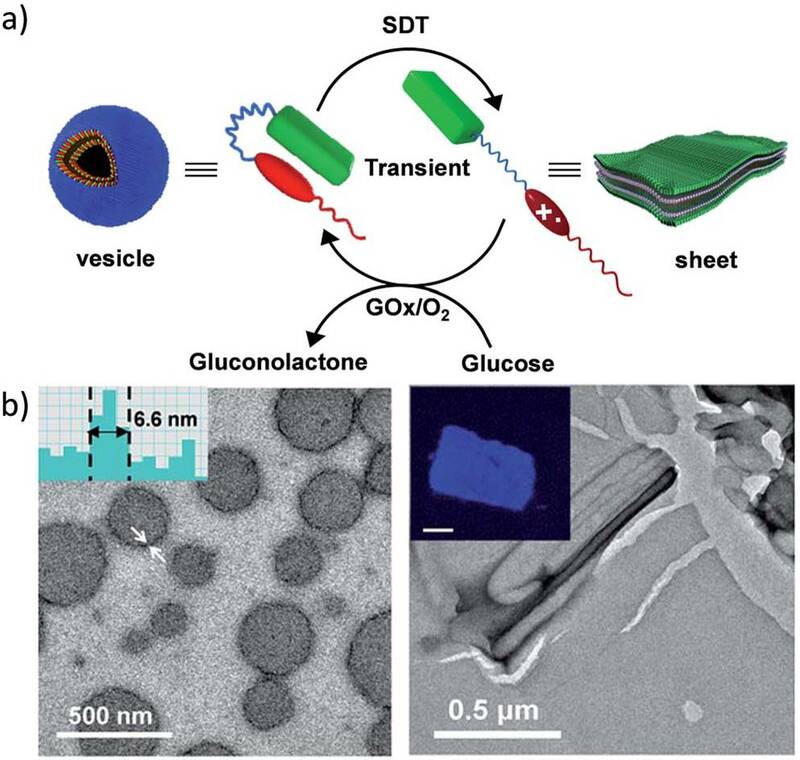 Since the reduction process proceeds much faster than the oxidation process, it is observed that PN-VN vesicles first extend to sheets momentarily and gradually but automatically fold back to vesicles within minutes. The rate of the transition can be well tuned by varying the concentration of glucose oxidase. Figure 2. (a) Schematic of the transient configuration change between vesicles and sheets. SDT: sodium dithionite; GOx: glucose oxidase. (b) Transmission electron microscopic images of the vesicles (left) and the sheets (right). Inset in the left panel shows the distribution of the wall thickness of the vesicles. Inset in the right panel is a confocal fluorescence microscopy image of a selected sheet (scale bar: 2 μm). Tianyu Liu is a Ph.D. in chemistry graduated from University of California-Santa Cruz. He is passionate about scientific communication to introduce cutting-edge researches to both the general public and the scientists with diverse research expertise. He is a web writer for the Chem. Commun. and Chem. Sci. blog websites. More information about him can be found at http://liutianyuresearch.weebly.com/. The referee-recommended articles below are free to access until 5th August 2017. Researchers in Spain have developed a light-driven catalytic process that offers a greener way to produce organic alcohols – important compounds used to manufacture pharmaceuticals and pesticides. Researchers have developed a catalytic system to reduce aromatic ketones and both aliphatic and aromatic aldehydes that uses earth-abundant metals and light. Read the full story by Jamie Durrani on Chemistry World. A computer that has been taught about organic chemistry can describe the forces in molecules as accurately as density functional theory (DFT), but hundreds of thousands of times faster. This combination of speed and accuracy could allow researchers to tackle problems that were previously impossible. Chemists hoping to use computer simulations face a dilemma. 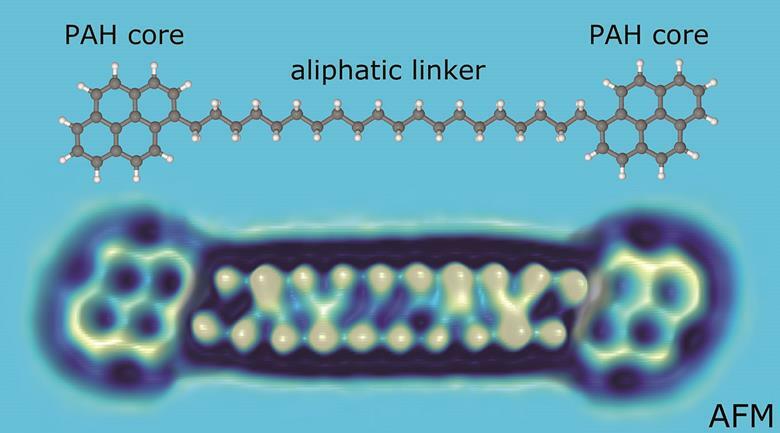 Researchers commonly need to know the energy of a molecule, and the forces that control how it twists and bends. Accurate methods like DFT, which use quantum mechanics, take the most computer power and time. Approximations such as semi-empirical methods give faster but less reliable results. Although there is a spectrum of options, most techniques ask researchers to trade off speed and accuracy. Read the full story by Alexander Whiteside on Chemistry World. Bacteria living on African ants make polyketides that are active against some drug resistant bacteria, new research shows. An impending crisis due to the rise of antibiotic resistant bacteria means there is high demand for new drugs to treat infections. Natural products shape the backbone of the antibiotics we use today, over half of which derive from compounds made byStreptomyces and other soil microbes. But researchers are now looking in more unusual locations for the next generation of antibiotics. Matt Hutchings from the University of East Anglia and colleagues have discovered a new family of antibacterial polyketides, called formicamycins, in bacteria living onTetraponera penzigi, a species of fungus-growing plant-ant. Not only have the team found a new family of molecules but the bacteria that made them, Streptomyces formicae, is new to the scientific community too. ‘Plant roots have lots of Streptomycesbacteria in them, and lots of insects like ants, particularly fungus-growing ants, also pick up these bacteria,’ Hutchings explains. Read the full story by Adrian Robinson in Chemistry World. Researchers in Japan have observed the stable hemi-bonded structure of (H2S)n+ (n = 3–6). Using infra-red (IR) spectroscopy, the team has experimental evidence for this unusual, previously only theoretically predicted, structure. The two-centre three-electron (2c–3e) bond, also known as a hemi bond, was first proposed by Linus Pauling in the 1930s. It is formed by the lone pair orbitals of a neutral molecule and its radical cation overlapping, causing the bonding sigma orbital to be doubly occupied and the antibonding sigma* orbital to be singly occupied. Read the full story by Suzanne Howson on Chemistry World. The world’s smallest lasso has been created by scientists in Saudi Arabia and the US. The molecular device threads through itself, forming a reversible noose, in response to chemical and electronic stimuli. The research team, led by 2016 Nobel prize-winner Fraser Stoddart of Northwestern University, were inspired by naturally occurring lasso peptides – molecules produced by a variety of bacteria, which consist of a linear peptide tail laced through a macrolactam ring. Following on from their previous work on identifying the structures of asphaltenes, researchers from Switzerland, the US and Spain have proven that they can identify tetrahedrally co-ordinated carbon backbones in model asphaltene molecules, and distinguish them from their planar aromatic counterparts. Read the full story by Philippa Matthews in Chemistry World. You are currently browsing the archives for the Hot Articles category.